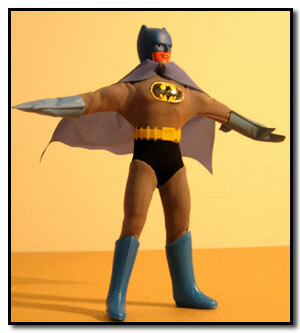 The WGSH Fist Fighting Super Heroes line was short-lived, being featured in the 1975 and 76 Mego Product Catalogs only. The line created an interesting problem for Mego because retailers questioned why they should buy regular WGSH that didn’t have the action feature. Indeed, it’s a bit of a puzzle why Mego didn’t extend the feature to all their WGSH figures. It may simply be that reaction from buyers was not have been positive enough to warrant it. Neal Kublan barely remembered the line in our interviews with him. This lovely ballroom dance/fight scene introduced the Fist Fighting Super Heroes in the 1975 Mego catalog. This photo is a classic. 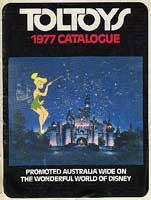 As the catalog was prepared well in advance of production, the figures are all Type 1 bodies! 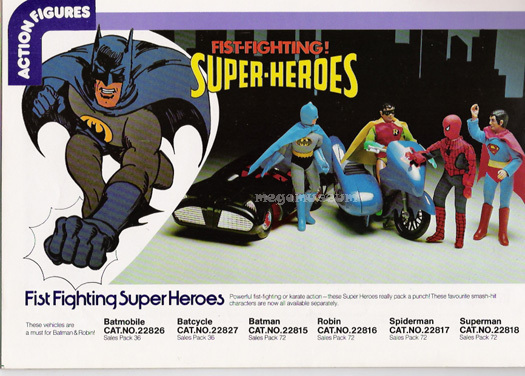 This Palitoy Catalog page shows the addition of Superman and Spiderman to the UK Fist Fighters line. Lizard and Captain America also were Fist Fighters in UK only. Click on the pics to see original Mego Fist Fighter Ads and the Fist Fighter sections of every Mego Catalog! Mego Fist Fighter are souped-up Type 2’s. As you can see from the illustration above the torso is essentially the same, but the hip unit attaches to the torso via an axle that is connected to the switch in the waist. The armholes are tooled out to accommodate freedom of movement. Note that UK/Palitoy Fist Fighter have a black waist button. fighting action. The twisting of the torso enhances the illusion. This image is from Mego’s U.S. Patent for the Fighting Doll body. Click to view a PDF of the 9 page patent. Because of this ball and socket mechanism the Fist Fighter can pose with his arms in ways an ordinary T2 cannot, either completely outstretched (above) or with hands on hips (below). right one throws an up and down Karate-Chop. Does it work? Pretty much. Things tend to turn into a slap fight after awhile, but a little practice helps. The clothes do tend to get in the way.